You know the market’s been in rally mode when just one or two down days can seemingly blindside analysts and commentators, leading some to question their faith in a continued stock rebound. For now, let’s just call last week’s Thursday-Friday downturn the third pullback since late December. The future will bring what it will bring. Welcome back worries of temporarily mothballed tariffs kicking in, and the resulting nail-biting over global economic growth. But as mentioned in “Fade the trade?” there will be plenty of news yet to come on this front, and the stock market has often reversed its initial reactions to such developments. 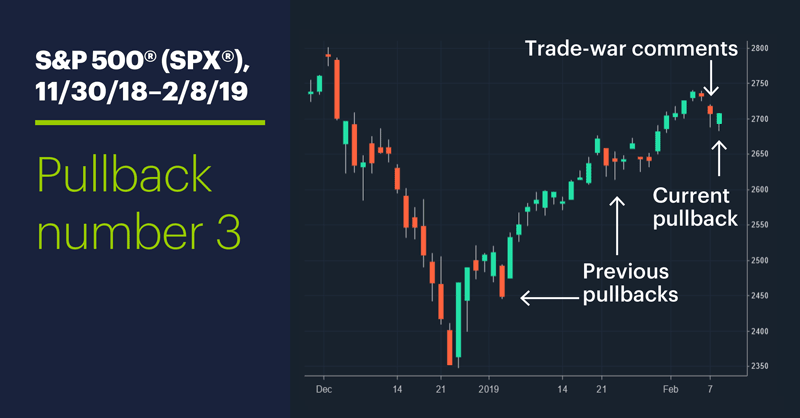 As of Friday morning, the SPX had fallen as much as 2% from its February 5 close—larger than its maximum decline during the late-January pullback, but smaller than its early-January downturn. 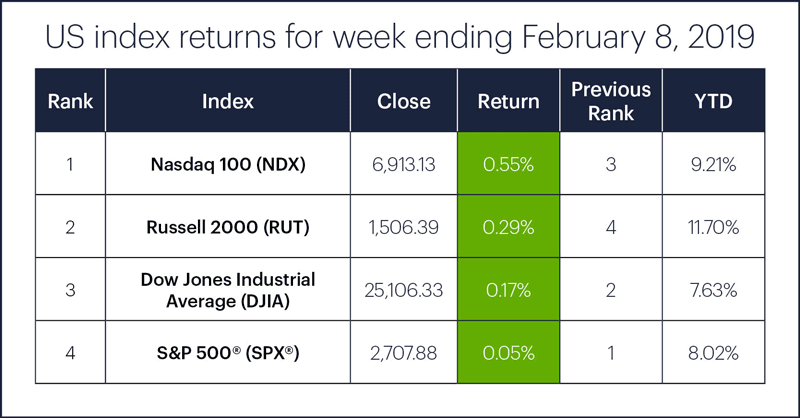 But worth noting: The market rallied well off its low on Thursday and again on Friday, when the SPX rallied into positive territory by the close. Sector action: The top-performing S&P 500 sectors were utilities (+1.9%), information technology (+1.7%), and industrials (+1.5%). The worst-performing sectors were energy (-3.4%), materials (-1.63%), and financials (-1.61%). Highlight reel: Biopharma made some noise last week. MacroGenics (MGNX) had the move on the week, nearly tripling to $32.42 in early trading Wednesday after releasing positive trial results for its breast cancer drug,3 but pulling back to close up 130% on the day. On the downside, Solid Biosciences (SLDB) tumbled -68% on Thursday in the wake of disappointing results for its gene-therapy muscular dystrophy treatment,4 falling all the way from $22.34 to $7.19. Futures watch: April gold (GCJ9) reversed a pullback with an intraday rebound on Thursday and upside follow-through on Friday, ending the week around $1318/ounce. After starting out the week with an intraday push to its highest level since November (approaching $56/barrel), March WTI crude futures (CLH9) slumped most of last week, closing Friday around $52.75. A pullback in March British pound futures (6BH9) appeared to reach at least a temporary inflection point last Thursday, as the pound rallied off a 13-day low to close up on the day, breaking a five-day losing streak. The pound closed slightly lower on Friday (around 1.2960), but well above Thursday’s low. Get ready for Thursday’s (latest) Brexit vote. ●Friday: Retail Sales, Import and Export Prices, Industrial Production, Consumer Sentiment, options expiration. Go to the E*TRADE market calendar (logon required) for an up-to-date earnings schedule, along with a complete list of splits, dividends, IPOs, economic reports, and other market events. The Active Trader Commentary also lists earnings announcements and economic report times every day. How hot is too hot? One of the more logical arguments for why the market could decline more is its continued strength. Before the market turned down last Thursday, for five consecutive days the SPX’s year-to-date (YTD) return had been higher than the comparable YTD returns of 96% of all years since 1950—that means only three other years had larger gains. Thursday’s sell-off dropped the SPX’s YTD return to the 91% level, while Friday's intraday rebound bumped it back up to 93%. The SPX’s past two pullbacks or consolidations didn't conclude until the index’s YTD return fell below the 90% level for at least a day. 1 Bloomberg.com. Trump Sees No Xi Meeting by Tariff Deadline, Stoking Trade Worry. 2/7/19. 2 CNBC.com. Dow drops more than 300 points as sources tell CNBC Trump-Xi meeting unlikely before deadline. 2/7/19. 3 TheStreet.com. MacroGenics Stock Soars on Positive Breast Cancer Trial Results. 2/6/19. 4 Investor’s Business Daily. Why This Biotech Stock Cratered 68% On Its Gene Therapy Study. 2/7/19. Dow Jones Industrial Average: Computed by summing the prices of the stocks of 30 companies and then dividing that total by an adjusted value—one which has been adjusted over the years to account for the effects of stock splits on the prices of the 30 companies. Dividends are reinvested to reflect the actual performance of the underlying securities. Barclays Capital U.S. Aggregate Index represents securities that are SEC-registered, taxable, and dollar denominated. The index covers the U.S. investment grade fixed rate bond market, with index components for government and corporate securities, mortgage pass-through securities, and asset-backed securities. Dow UBS Commodity Index: The DJ-UBSCI is composed of futures contracts on physical commodities. Unlike equities, which typically entitle the holder to a continuing stake in a corporation, commodity futures contracts normally specify a certain date for the delivery of the underlying physical commodity. In order to avoid the delivery process and maintain a long futures position, nearby contracts must be sold and contracts that have not yet reached the delivery period must be purchased. This process is known as "rolling" a futures position. The DJ-UBSCI is composed of commodities traded on U.S. exchanges, with the exception of aluminum, nickel and zinc, which trade on the London Metal Exchange (LME). MSCI EAFE Index is a free float-adjusted market capitalization index that is designed to measure the equity market performance of developed markets, excluding the US & Canada. The MSCI EAFE Index consists of the following 21 developed market country indexes: Australia, Austria, Belgium, Denmark, Finland, France, Germany, Hong Kong, Ireland, Israel, Italy, Japan, the Netherlands, New Zealand, Norway, Portugal, Singapore, Spain, Sweden, Switzerland, and the United Kingdom. The MSCI Emerging Markets Index is a free float-adjusted market capitalization index that is designed to measure equity market performance of emerging markets. The MSCI Emerging Markets Index consists of the following 23 emerging market country indexes: Brazil, Chile, China, Colombia, Czech Republic, Egypt, Greece, Hungary, India, Indonesia, Korea, Malaysia, Mexico, Peru, Philippines, Poland, Qatar, Russia, South Africa, Taiwan, Thailand, Turkey and United Arab Emirates. S&P 500 Index is a market capitalization-weighted index of 500 widely held stocks often used as a proxy for the US stock market. All components of the S&P 500 are assigned to at least one of eleven S&P Select Sector Indexes, which track major economic segments and are highly liquid benchmarks. Stock classifications are based on the Global Industry Classification Standard. The Select Sector Indexes are: Consumer Discretionary Select Sector; Consumer Staples Select Sector; Energy Select Sector; Financials Select Sector; Health Care Select Sector; Industrials Select Sector; Technology Select Sector; Materials Select Sector; Telecommunication Services; and Utilities Select Sector. The Russell 2000 Index measures the performance of the small-cap segment of the U.S. equity universe. The Russell 2000 Index is a subset of the Russell 3000® Index representing approximately 8% of the total market capitalization of that index. It includes approximately 2,000 of the smallest securities based on a combination of their market cap and current index membership. The Russell 3000 Growth Index measures the performance of the broad growth segment of the U.S. equity universe. It includes those Russell 3000 companies with higher price-to-book ratios and higher forecasted growth values. The Russell 3000 Growth Index is constructed to provide a comprehensive, unbiased, and stable barometer of the broad growth market. The Index is completely reconstituted annually to ensure new and growing equities are included and that the represented companies continue to reflect growth characteristics. The Russell 3000 Value Index measures the performance of the broad value segment of the U.S. equity universe. It includes those Russell 3000 companies with lower price-to-book ratios and lower forecasted growth values. The Russell 3000 Value Index is constructed to provide a comprehensive, unbiased, and stable barometer of the broad value market. The Index is completely reconstituted annually to ensure new and growing equities are included and that the represented companies continue to reflect value characteristics. The Nasdaq Composite Index is a broad-based index that includes all domestic and international-based common stocks listed on the Nasdaq Stock Market. The VIX®is the ticker symbol for Chicago Board Options Exchange (CBOE) Volatility Index®. The index, also called the fear index, is calculated by CBOE and generally measures expected volatility of the U.S. market in the next 30 days. The higher the number, the more bearish the market is in general. The VIX is used to calculate the put/call ratio. It is not possible to directly invest in an index.